As a store owner, you have a lot of responsibilities. Keeping customers happy and coming back again is the most obvious – and one of the most difficult. Growing your business is a daily challenge – competing with several competitors for the same customer… well, sometimes your objective becomes simply to keep from losing any. A BOTTLECAPPS™ eCommerce website allows a retail store to break-through the limitations a physical location presents, while increasing sales of its products and brand online. BOTTLECAPPS™ websites also automatically sync with their other digital products, creating an easy to use synergy to your store’s digital marketing strategy. 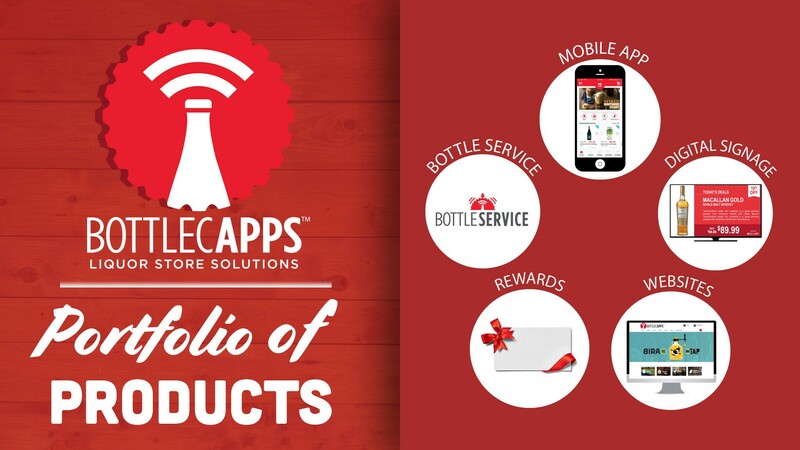 The BOTTLECAPPS™ app is a cloud-based smartphone application, branded with a store’s logo and name, which runs on both iOS and Android smartphones and provides liquor storeowners and managers the ability to sell their products effortlessly within a smartphone. An app user can shop for beers, wines, and spirits wherever they may be located—items can be picked up at the store or delivered. Bottle Vision™ is an effective way to engage your in-store customers. With the BOTTLECAPPS™ system, you can prominently show promoted products, events, custom videos, and sales pricing. You can assign multiple lists and schedule out ads to run and expire on a given date. You can also display on a single screen or multiple screens throughout the store. The best part: it’s all managed through a back-end webconsole and works in conjunction with all other BOTTLECAPPS™ products. Bottle Service™ is a ‘Concierge Marketing Services Package’. The purpose of this service is to support, guide, and influence the overall marketing efforts of their store-level portfolio of products, and to help our clients’ set and maintain a profitable mobile/ecommerce strategy. BOTTLECAPPS™ is the leading provider of digital, ecommerce solutions for the retail beer, wine, and liquor store industry. With this partnership, we aim to bridge the relationship between our clients and their ability to sell their products directly to their customers–all from the convenience of a mobile phone app, ecommerce website, or in-store digital signage. With MPOWER Partnership Packages starting as low as $199/month, BOTTLECAPPS™ and their staff is ready to help bring your business into the ecommerce era. Give them a call or check them out online today!